If you’ve been in a casino in the past few years, you know that all kinds of TV shows are being made into slot machines. Everything from game shows like Wheel of Fortune and The Price is Right to sit-coms like The Beverly Hillbillies and The Munsters. But I never thought I’d see the day when infomercials were seen as fodder for casino games. “Ron Popeil’s But Wait! Win More!” slot machine from IGT was unveiled at the 2004 Global Gaming Expo. Such classic Ronco products as the Popeil Pasta Maker and the Inside-the-Egg Scrambler replace bars and 7s here. Rather than lemons or cherries, this slot presents carrots, onions, and other vegetables, presumably sliced by the Ronco Dial-O-Matic. 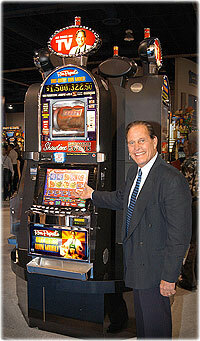 Videos of Ron Popeil himself appear during play to introduce bonus games. And sitting atop this shrine to the “King of Infomercials” is a replica of the Showtime Rotisserie complete with rotating chicken. This really is a great idea. So many people have spent money on Ron’s gadgets over the years just to have them collect dust in a kitchen drawer or end up “re-gifted” to some distant cousin. Now they have an opportunity to win some of that money back. Everything I’ve read about the Popeil slot says that it was introduced as a “prototype” in 2004. I’d be interested to know if anyone has actually seen this machine in a real life casino anywhere. If this slot becomes popular maybe infomercial-themed slot machines will become a trend. Could the Tommy Vu Poker Slot be far behind? See some great pictures of the Popeil slot here, here, and here. I love to play slots based on TV shows and love to see familiar character faces and voices on these slot machines. It is a great way to get more players onto the slot floor. One of my favorite slot machines is Jeopardy, and I love to hear Alex Trebeck with his familiar voice. Years ago I saw and played this machine at the Rampart Casino, a locals casino in Las Vegas. I presume it was being tested out there, and apparently it must not have done too well since it was the only place I ever saw the game, and it was gone the next time I visited. I loved the concept of the game, although I recall it being very difficult to get a bonus, which at least for me was a detriment to continuing to play it.